After much tinkering under the bonnet and scratching of heads we’ve finally got the Donate button to work. Apologies for everyone out there who’s been trying to donate and come up against unfriendly error messages and please don’t be shy to try again! For anyone that’s interested the problem with getting it to work is the fact that PayPal doesn’t like FRAMES ( nor do we particularly but WordPress does) so doesn’t allow the use of their payment pages to be displayed inside of a FRAME. It’s a security thing as PayPal doesn’t want people to enter their PayPal account password into any page whose URL does not begin with https://www.paypal.com/. Anyway if using FRAMES, you will want to add target=”paypal” in the <form action> tag of the HTML code to prevent the payment page from being displayed in a FRAME. I realise this is all totally off topic and probably very boring but having spent time trawling various forums and other people’s blogs for solutions it only seemed right to share! The final total of the Birmingham sale and raffle was £150! Big thanks to all involved, especially Sally for organising it all. Plans are also afoot to set up a book box akin to the Peterborough and London successes. If these ongoing sales are anything to go by, we’ll be hitting the £19,000 mark any day! It’s amazing how much money you can make from donated secondhand books, CDs, videos and DVDs. The total raised from books (50p a go) is now around £1500! Not bad for nine months worth of donations. Why not set one up in your office – it’s easy! All you need is a communal space where people wait for kettles to boil, some books to get you started and somewhere for people to leave the money. People will donate books, buy new ones and probably donate them once read. It’s an easy way to raise money for stuff4sam and recycle your unwanted things at the same time! What are you waiting for? Big thanks go out to two Day Centres in Peterborough who have given us donations. The Cresset Day Centre and Copeland Day Centre donated £43.00 and £33.00 respectively. They are attended by the father of one of the receptionists at the Peterborough office, Vivien Punter. The people who attend – all elderly – put in their small change and at the end of a certain time, the money is donated to a charity they wish to support. Its James here, Hugh’s co-rider from last summer’s epic bike ride. I’m in Afghanistan at the moment running reconstruction projects. 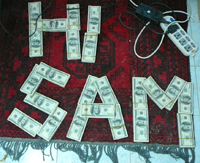 Here’s a ‘Hi Sam’ that we made out of money (about $230,000!) – sadly I can’t donate the money! The unwanted presents sale in Birmingham raised £90 and counting thanks to ongoing raffle ticket sales! Thanks to everyone who donated and bought items. There will be a post-Christmas, pre-Spring sale in London on Friday 9 March. We are looking for special items to include in a raffle. Last year prizes included Tea at the Ritz, a beauty treatment, signed Jacqueline Wilson books and Clarins products. Do you have something special to donate? If so please email us at stuff4sam@gmail.com or send it to: Stuff4Sam, PO Box 54662, London, N16 8YG. 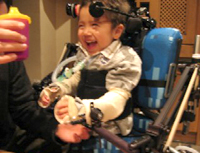 We hope that the sale will help us reach the £20k mark by Sam’s birthday. I just really want to send over some photos to show how wonderful Sam’s new arm supports are. They cannot fully convey their use, but now he can do painting by attaching a paint brush onto these supports. 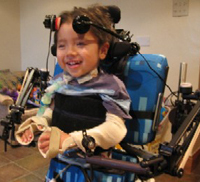 As you can see from the photo, he also has switches around his head to activate his accessible toys. His head control is getting really strong, so now we have to keep an even closer eye on him!! He also has a great fun with his newly arrived electric wheelchair (still one on loan, his one has not yet been completed, which is frustrating!). He has very good chin control and is gradually getting an idea of controlling his movement. This is another reason why we need to watch over him so closely, as he can zoom off so quickly!! That’s all for now. We are all well, and Sam is very happy despite some little colds now and then.